Have you experienced abusive treatment from a credit card company, "for no reason" (meaning, you did not do anything wrong)? No, I've never had a problem with a credit card company abusing me "for no reason." Dr. Lahm testifys for a hearing of the U.S. House of Representatives, Committee on Small Business entitled, "The Role of Credit Cards in Small Business Financing." Link to PRWeb release. Link to written testimony and exhibits. Another abusive practice, targeting students; are higher education institutions “partners” or “pushers”? If Chase did no wrong, why did it settle for $100 million dollars? Have you been solicited for a small business/professional credit card? ChangeInTerms.com site poll finds 97% of respondents have experienced abusive treatment from a credit card company “for no reason” (meaning, the customer did not do anything wrong). SVP of Customer Service at Chase — “Please just transfer your accounts to another bank and leave me alone”? I want to take my boy fishing, but I find I’m just wishing. It truly is time, for a “Showdown.” Wear your colors proudly (red, white, and blue). 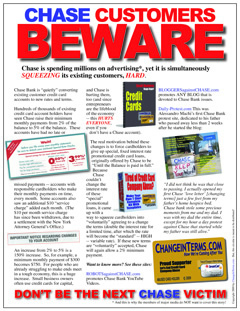 Sauer v. Chase Bank USA, N.A. The first of several outstanding short films from our friends at Binary Star Productions, Inc. This is the second of first of several outstanding short films from our friends at Binary Star Productions, Inc. -- It really is time for a Revolution! Dr. Lahm served as a production consultant for this film, and is pleased to be of service to his friends at Binary Star Productions, Inc.